The Visitor Centre – A Legacy for Learning and Discovery, will be located at the site’s new entrance on Fort York Boulevard, outside the walled fort. This 24,000 square foot building will serve as gateway and hub for the entire national historic site. It will host multimedia presentations and highlight dramatic exhibits and storied objects such as the regimental colours of the Third York Militia, hidden from hostile forces occupying the town following the Battle of York. 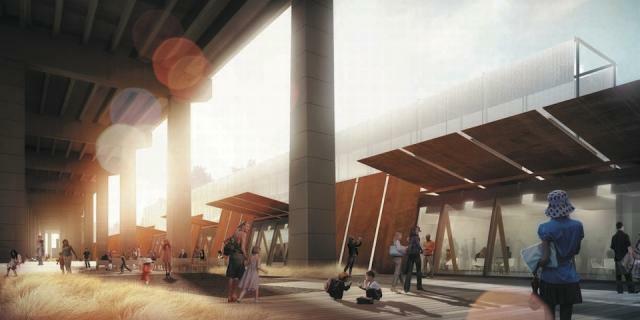 It will contain a resource centre for material about Fort York and the War of 1812, complementing a new Toronto Public Library branch opposite the fort on Bathurst St. The Centre will also host community events, opening up Fort York to new admirers. UrbanToronto Adds Its 200th Entry To The dataBase… and more!